Four years ago, Baltimore felt like it was making progress in our pursuit to increase public safety. Homicides had experienced a two-decade long decline and there was optimism that the downward trend in crime would continue. That optimism quickly faded after the unrest that followed Freddie Gray’s death. Like the rest of our city, we knew we had to act – and we did. 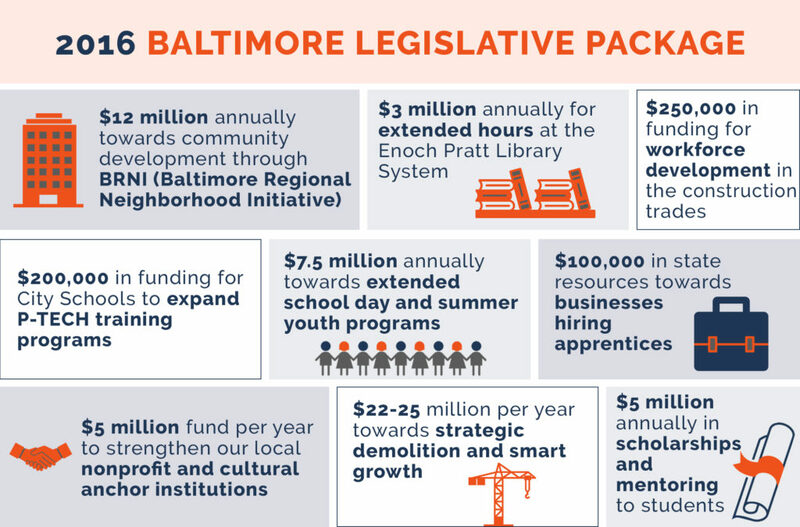 We began work immediately on what became the Baltimore Legislative Package of the 2016 Legislative Session. Allocating additional funding for students, workforce training, and development was an important step towards building a safer City, but there was more to be done. We needed to work together to revise our antiquated criminal justice system. 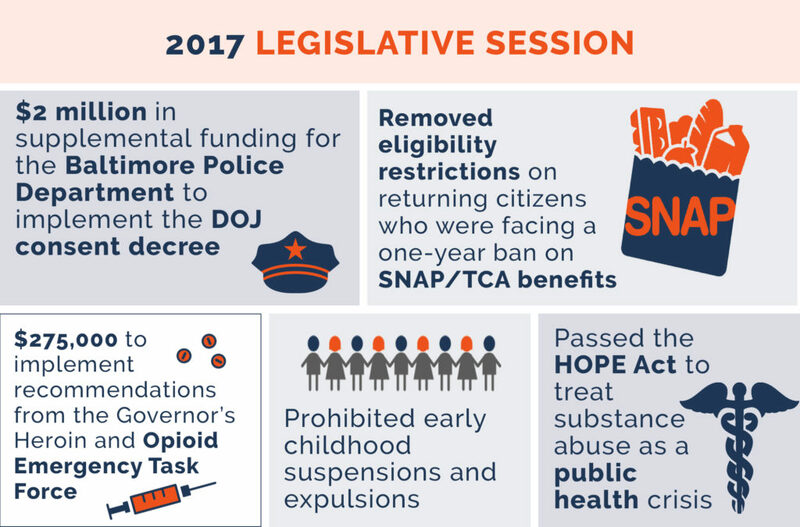 That’s why we passed the landmark 2016 Justice Reinvestment Act, which included provisions to treat addiction rather than incarcerate those with addiction and targeted violent offenders. Not satisfied by the actions at the state and city levels, we recognized the need for a comprehensive plan to build safe communities in both the immediate and long-terms. We released a proposed framework for violence prevention including clear, achievable policy outcomes. Entitled, “Baltimore PROSPERS,” we outlined concrete steps that the Maryland General Assembly, Governor, and City of Baltimore could take to keep our residents safe, while taking a proactive approach to crime prevention. Many of those recommendations were quickly implemented, like the hiring of a Director of the Mayor’s Office of Criminal Justice and increased coordination between state and local agencies. Since then, we have worked throughout the 2018 Legislative Session to produce real results for the residents of the 46th District. Ban owning, or using a bump stock in Maryland. Pass a “red flag” law to create a process where a court may prohibit a person from accessing a firearm for a short duration if s/he poses a risk to him/herself or others. Disqualify a person charged with a domestically-related crime from owning or possessing a regulated firearm. To continue to move Baltimore City forward and create the community we all want to live in, we need proven leaders. 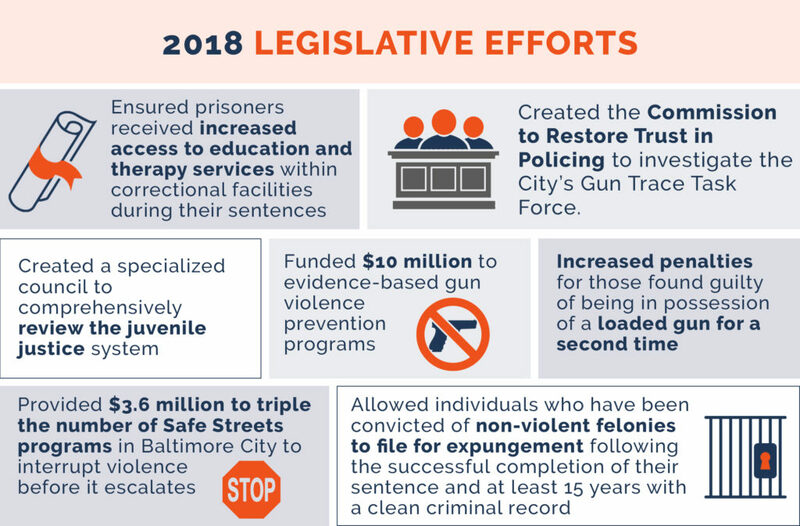 Our accomplishments over the past 11 months have offered a glimpse into the future that Baltimore PROSPERS offers, and has demonstrated our capacity to address crime and violence through securing state resources and pushing the needle with our state and city executives.